How would the remote of an Apple television work? The rumors that Apple is making a television have been ebbing and surging over the past several years, but some recent tidbits of info have increased the speculation. Among these is the fact that, in his biography, Steve Jobs alluded to the fact that he had figured out how to solve the problem of an ‘integrated’ television. It’s not clear when Jobs said this, so it is hard to say if he saw Siri’s voice control as a part of this solution, but it’s easy to imagine that he did. But voice is a bit problematic. As can be seen in this humorous video that was passed around in which Jack Donnaghy, Alec Baldwin’s 30 Rock GE executive, demonstrates a voice-activated television. Even if a control word were implemented, a-la “Siri, change the channel”, rather than just “change the channel,” it would still likely be a compliment to any TV control system, rather than the primary method. And its this topic of control that interests me. There are a lot of other things about an Apple television that bear discussing. Why it makes sense for Apple to produce one at all, how it could be profitable in such a low-margin business and even how the current system of channels could be adapted to iOS’ architecture of apps. But controls are just as important. The ease of their use, and the capability that a user has to access channels and content in an intuitive and immediate manner, along with the relative complexity of accessing web-based content versus ‘live’ TV, all make it a key issue. Simply put, if the Apple television is the next generation of integrated TV, what would be the best way to control it? Currently the Apple TV uses the same 7 button remote that has been shipping with it, and Macs until Front Row was ditched in Lion, since the beginning. The looks have changed, but the function is the same. 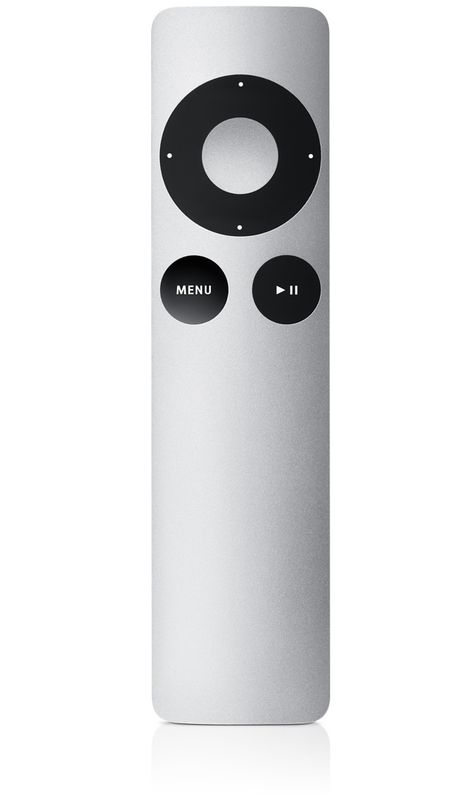 I think that it is safe to say that this is out as the remote for any proposed Apple television. Too limiting, especially for text entry and too narrow in scope already for the functions of the Apple TV, much less a more expansive television product. It’s easy to see what Apple was thinking when it created this remote in the first place. Look at your normal TV remote. It’s likely that the buttons have a sort of patina on them from your fingers. Turn it to the side in the light and you’ll notice that only a handful of the buttons have a sheen to them. Those are the ones that you use with any regularity. Among those are the channel, volume and perhaps input switch buttons. If it’s a cable remote, perhaps the guide or on-demand buttons get a workout. The current Apple TV remote handles most of those buttons by assigning contextual behaviors to its “UDLR” control pad. If you’re in a menu, they navigate, if you’re watching something, they transform into volume or fast-forward/rewind buttons. But it’s safe to say that a future Apple television would have more going on than your regular TV, and I, among many others, use the remote more out of a sense of immediacy than due to any real love for it. Which brings us to the second possibility, why wouldn’t an Apple television (lets just start calling this thing the iTV) just be controlled using your iPhone, iPad or iPod touch? Apple already makes a Remote app for them that manages to control things fairly easily and makes for a better text-entry platform by far. The simplest explanation for this being a bad idea is that, while many potential iTV purchasers would likely be iPhone or iPad owners, the potential market for an amazing integrated television would be far larger even than that for iOS devices. Not only that, but the Remote app isn’t for regular people. The setup is kind of finicky and the app itself has several confusing modes. I use it, but my wife hates it and sticks to the small regular remote. Now, she’s smarter than me so its not the complexity, but the immediacy that appeals to her. She picks it up and click click. Rather than having to stop what she’s doing on her iPhone and open the app, find the right mode and make it happen. But we do both like the music controls, which look and feel much like the iPod (now Music) app and allow us to control the playback from anywhere in the house. So, it’s a given that Apple would never limit itself to just those customers that have iOS devices, and it wouldn’t provide the crappy existing remote without offering other customers the same expanded control options of iDevice users. This ‘iTV Remote’ has everything that you need to control a next-gen TV. 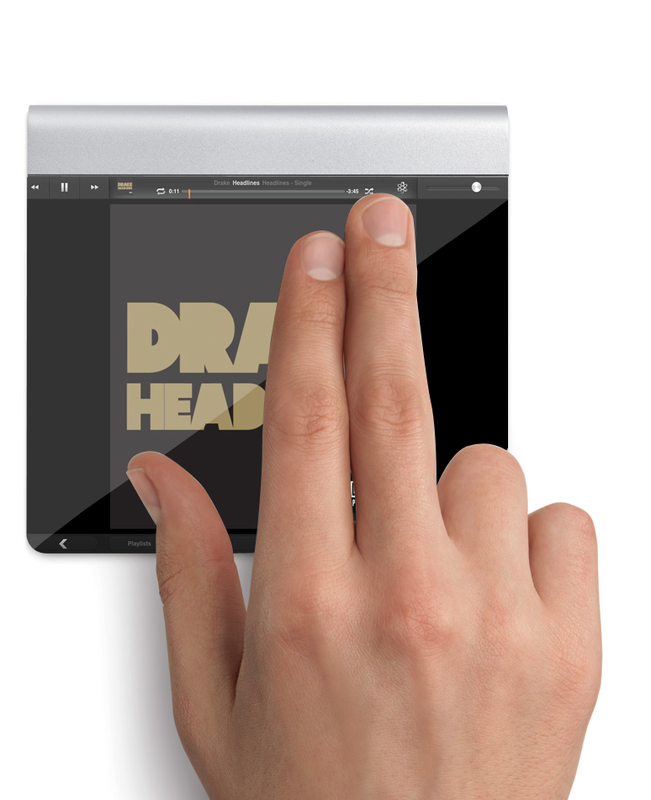 A modal interface that transforms it into any type of remote you need for the situation, a small microphone to activate voice control, an interface that is incredibly familiar to any user of any smartphone and the ability to present content channels directly as ‘apps’. Instead of launching an app on the remote, it would launch on the iTV itself. It effectively takes everything that makes iDevices so good and packages them as a dedicated remote. Every iTV would come with one of these things and it could be updated wirelessly over-the-air to include whatever new content partners Apple pushed to the iTV. It could even include that secondary 7 button remote as a low-powered option. This would work over low-power Bluetooth 4.0 and come pre-paired to your iTV. It could display apps, a control interface similar to the one in the Remote app, a guide of what is available to watch or even information about the program that you’re watching. Any Siri voice commands could be spoken into the remote sitting right on your armrest instead of shouted across the room at your TV. I’m finding it easier and easier to believe that Apple is close to releasing a full-on television. Apple’s current economies of scale and supply chain prowess have given it the ability to make a really great TV that is also profitable. And if it does release one, I hope that the control scheme that it uses is something like this. Read next: Highlining in the sky: These flying Frenchmen make Superman look lame.